Is your preschooler going into kindergarten next year? Even if they aren't, this kindergarten readiness activity can be altered for younger children. It's an "oldy-but-a goody": M & M Math. 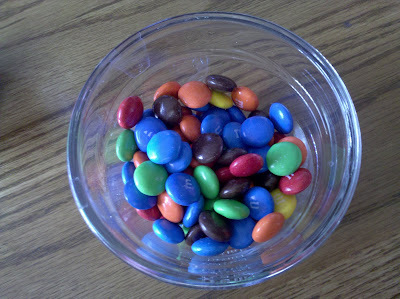 Any small candies will work, however, M & M's seem to be a universal favorite amongst all children. 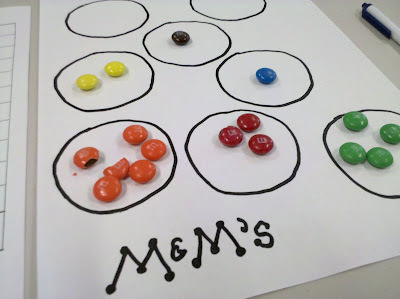 Draw as many medium size circles as there are M & M's. (six-ish). 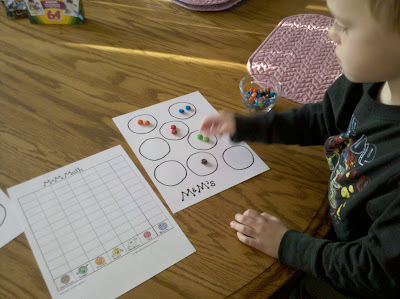 Have your child sort the M & M's by color into each circle. For preschoolers getting ready for kindergarten, you can line graph them. You'll need a ruler to draw your graph like the photo below. Muffin Tin Boy, who is a preschooler, had a little interest in the graph. But Muffin Tin Girl loved it and loved seeing the results in a different way. You can count how many are in each row/circle and talk about which one has less/more or least/most. You can talk over how they taste and if the different colors make the candies taste different. M & M's all taste the same, but this might be effective with Skittles. Most important, they got to eat the candies after they were done. What about you? Do you have any tips for sorting candies or kindergarten readiness? I'd love to hear about it! I have to say that this is great. We do this very same activity, except I have my Little Bit sort into .... muffin tins! :D And to add interest, I make sure I get a package of the holiday M&Ms when they are available. It gives her more colors to sort. I hadn't thought about the line graph though. I may have to add that next time. Melinda - we do that too, for my daughter, laying them out on paper made it easier to count them. Christy - there is a book? awesome! We have the same book as Christy. Love it! Have a wonderful, chocolately day! What a great idea! I'll have to try it this year as we start preschool again with my 2 youngest.